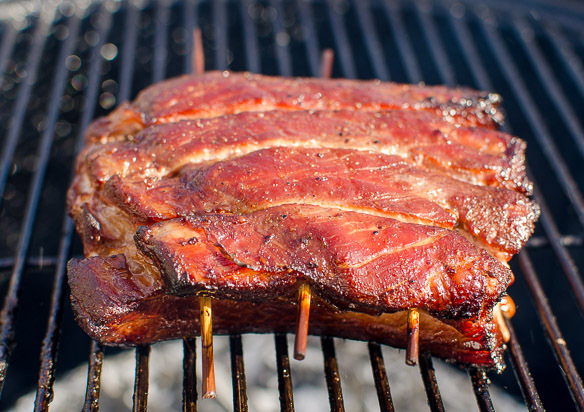 What’s not to love about smoked pork belly? Eating pork belly is a guilty pleasure. Whenever I see them on a menu, I can’t resist. 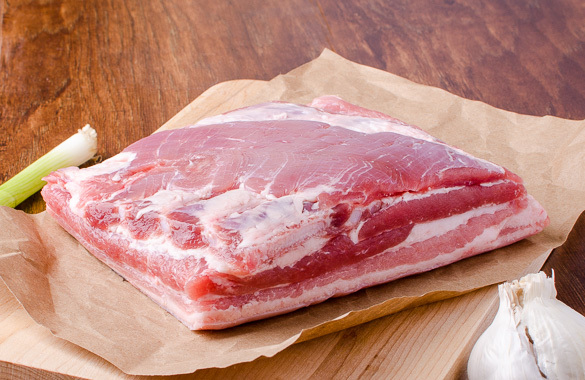 Cooking a good pork belly can be hard to do but here are some tricks to doing it right. Pork belly is unsliced and uncured bacon. 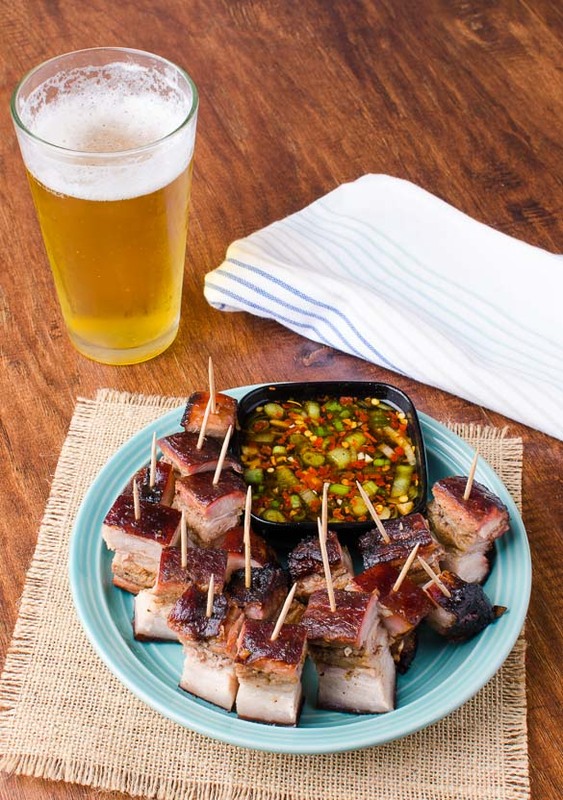 I’m always playing around with new ways to create delectable morsels of smoked pork belly. I love it when the porky flavor explodes in my mouth and the bite is coupled with the thick crunch of crispy pork skin. So how does one create such tasty pork morsels? My Soy Vinegar Barbecue Pork Belly is another one of my creations which I think you will enjoy immensely. 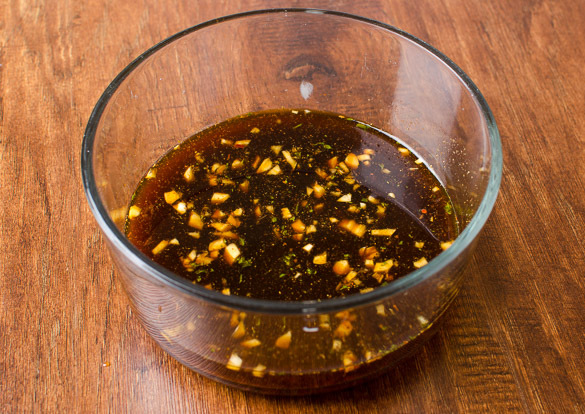 I’ve combined a Carolina-inspired vinegar brine with soy sauce to create a sour, sweet, salty, and spicy profile. 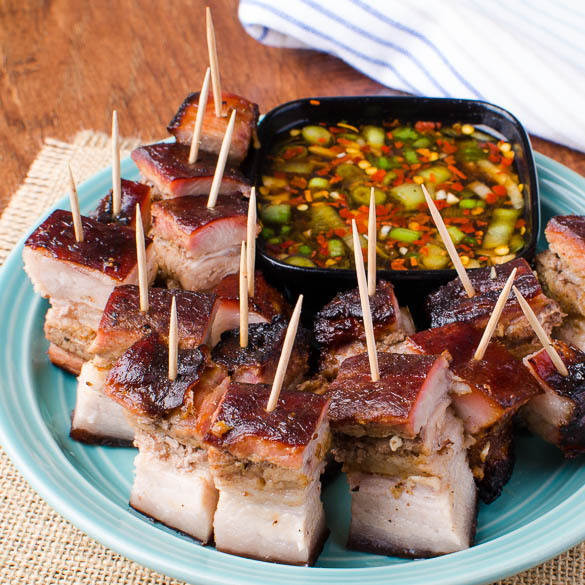 The combination of vinegar, honey, soy sauce, and garlic converts the raw pork belly, smoked low and slow, and then broiled, into a bite that will amuse and amaze your guests. 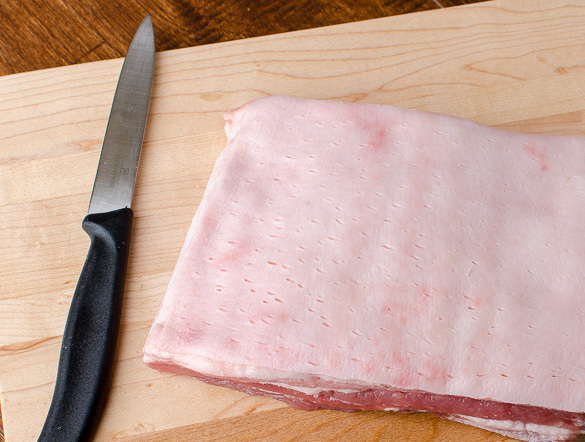 Place pork on a work surface, skin side up. Using a jacquard tool, or the point of a sharp knife, make hundreds of small holes that just puncture the surface. Flip over, skin side down. 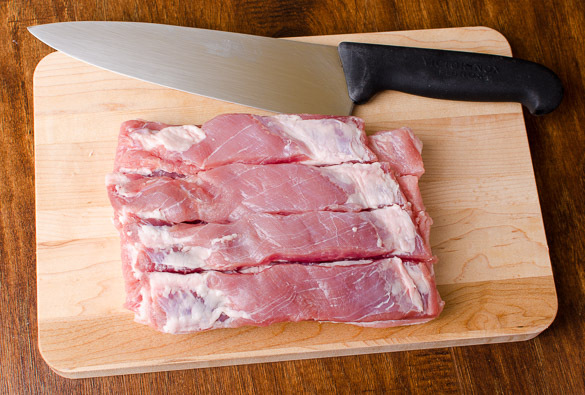 Use a sharp knife to score the meat with 1 inch deep slits lengthwise spaced 1 ½ inches apart. 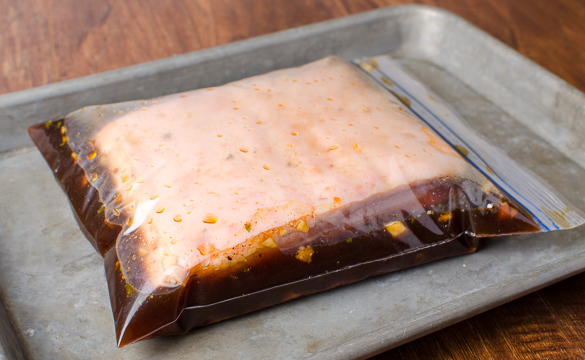 Place pork belly in a plastic gallon bag and pour marinade all over the pork belly ensuring that it's sitting in the marinade. Leave overnight in fridge with skin side up. Preheat Kettle pit to 300F with a hot zone and a cool zone. 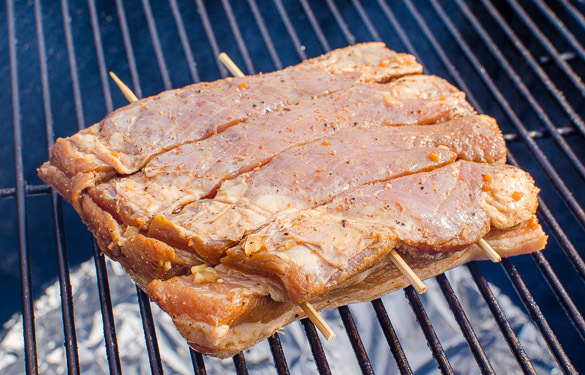 Thread metal or bamboo skewers through the pork belly to minimize it curling when it cooks. 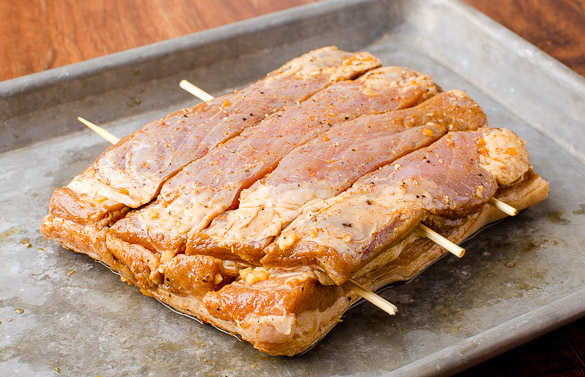 Wipe off excess marinade from skin and place the pork belly skin side down in the indirect cool zone. This allows the fat to drain from the skin. Cover pit with lid and cook at 300F for about 90 minutes or until the internal temp is 180F and probe tender when poke tested with a bamboo skewer. Flip the pork belly so it is skin side down and place on the hot zone to brown the skin. Take care not to burn it by moving it between the hot and cool zones to crisp the skin. Alternatively, you can do this in your kitchen oven broiler. Rest 15 minutes loosely tented. 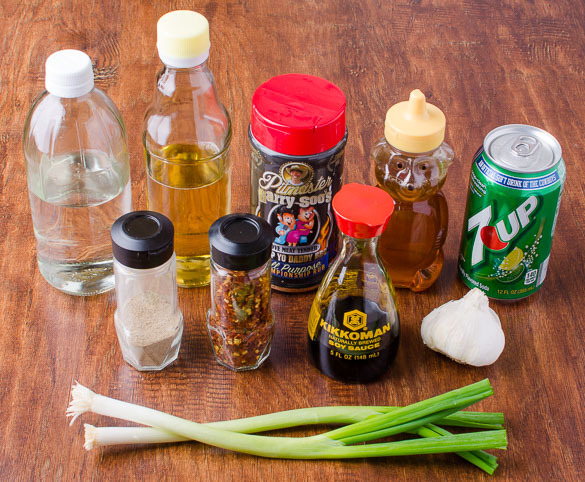 Cut into chunks and serve with the soy vinegar dipping sauce and your favorite beer. This recipe looks amazing! I will definitely give this a try! Thanks Harry! Harry this looks so good. Time to fire up the smoker, I’ve got to try this recipe. You’ve got yourself a new fan! awesome! Send me pics when you try my recipe! Thank you for your share. My wife will try to make this food. We love your blog. Thank you for your job. At point 8 you say to cook it skinside down and at pont 9 you say to flip it again with skinside down.. a typo? Anyway will try this recepie out.